In the April issue of Townhall Magazine, where this article first appeared, Katie Pavlich explores how wind energy is subsidizing millionaires, raising energy costs, and destroying the environment. When you drive on the highways spanning across western Texas, there’s no doubt you’re in a part of the country rich with energy. Driving through little Texas towns, you can see oil wells hard at work, proving the energy industry in the state provides the people living here with an economic future. Continuing south down US-84 just after Post, Texas, a look to your right presents a beautiful ridge completely covered in wind turbines. As you make your way south to Roscoe, home to the world’s largest wind farm, the landscape of cotton fields becomes engulfed in big, white turbines. On this flatland, you can see miles and miles of windmills 360 degrees around you as it spans more than 100,000 acres, or 157 square miles. It’s a cold day and it’s windy, but many of the turbines still aren’t blowing or creating energy. Two men in white pickup trucks are pulled off in the middle of a cotton field fixing one of them. Wind energy has become increasingly popular in this part of Texas over the past decade, and a picture of old versus new is clearly painted when modern wind turbines are seen working next to rusted oil pumps. But does wind energy really offer the same bright economic future as oil’s proven track record? Despite the hundreds of square miles of wind turbines in the Lone Star State, just 6.4 percent of electricity used to keep the lights on in homes comes from wind. Nationally, it’s just 3 percent. On average, turbine blades span from 116 to 212 feet, turbines tower above the land at more than 350 feet and are spaced between 900 and 1,000 feet apart. 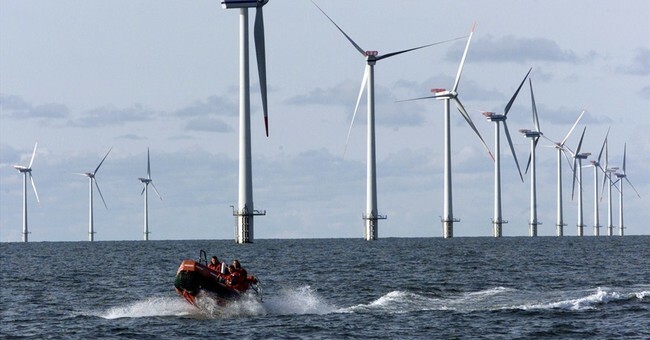 In order for the turbines to be safely secured, two things have to happen. If the ground is soft, deep holes must be dug and filled with a concrete base. If the ground is hard, shallow, wide slabs of concrete are poured. The amount of concrete and depth also depend on the model of turbine being constructed. In addition, obstructing trees are cut down to make room for wind turbines to operate. “The steel tower is anchored in a platform of more than a thousand tons of cement and steel rebar, 30 to 50 feet across and anywhere from 6 to 30 feet deep. Shafts are sometimes driven down further to help anchor it, and mountain tops have to be blasted for it” a report from the organization Wind Watch states. The earth is trashed in the process of building these farms, something big wind companies, so-called environmentalists, and the government don’t want people to know. Not only are hundreds of miles of land destroyed with concrete that is often left behind by companies when a farm is out of use, the products necessary to manufacture wind turbines are mined in China without regulation and with a byproduct of toxic, radioactive waste. There are always certain environmental sacrifices that must be made in order to sufficiently fuel our economies, to heat our homes, and to survive. But for decades, the green industry has argued that wind energy is an environmentally friendly alternative to oil. This argument fails to pan out when breaking down the stark environmental cost of the wind industry. Mining the rare earth materials needed to go into a wind turbine is an intensive process. Each wind turbine requires 8,000 different components and according to The Institute for Energy Research, that demand is expected to increase by 700 percent over the next 25 years which means more “toxic lakes” and sickness in China. A 2011 Daily Mail investigation revealed the wind industry’s demand for rare earth materials are poisoning Chinese farmers and their families, and are causing long term damage to the earth and health of the human population. After these materials are mined over- seas, they must be transported to the United States by diesel powered cargo ships. According to Wind Watch, once the material gets here, the transport of these massive parts presents problems and re- quires that many roads be widened or that new roads be built altogether, prompting construction projects and the use of more carbon emitting vehicles and tools. But it isn’t just humans wind impacts negatively, wildlife has greatly suffered as a result of the inefficient industry. Each year wind turbines kill hundreds of thousands of birds, including those on the endangered species list like bald and golden eagles. Under the Bald and Golden Eagle Protection Act, an individual simply having eagle feathers or parts in their possession will land them in prison with a heavy fine to pay. Felony killing of eagles carries a $250,000 fine and two years in federal prison. Wind companies are responsible for the deaths of thousands of eagles each year, but aren’t punished. After years of slaughter, the Obama administration gave the industry an official free pass on the law in 2013 after the Interior Department passed a rule waiving the punishment of wind farms killing eagles for the next 30 years. Thirty years of a free pass means millions and millions of dead birds. The wind industry is responsible for more animal deaths in one year than the oil industry has ever been. Regardless, hypocritical green activists aren’t out in the streets protesting wind and the Obama administration is willing to look the other way so long as wind serves its political purposes. Only one energy company, Duke Energy, has been fined for killing eagles. The punishment came down on the company for the killing of just 14 eagles. Again, wind turbines kill thousands of birds and eagles every day. But birds aren’t the only animal falling victim to this green energy hoax. According to a study released by the University of Colorado, wind turbines are chopping up at least 600,000 bats per year, a number scientists say is a low estimate. Bats are a crucial part of the ecosystem through their work eating malaria-carrying mosquitos and pollinating crops. When the calendar changed to 2014, the multi-billion dollar wind energy production tax credit expired, but that doesn’t mean wind companies still aren’t reaping benefits from the taxpayer. When companies secure the subsidy through proof of new farm production, it lasts for 10 years regardless of whether the initial subsidy is renewed by Congress. In other words, wind companies only had to start production in order to claim the subsidy. Further, wind partnerships and investments in farms come from wealthy investors who benefit from government cronyism. “The wind industry would not exist without a large class of wealthy investors who have figured out that they can get guaranteed returns on their investment,” Myron Ebell, director of Energy and Global Warming Policy at the Competitive Enterprise Institute, tells Townhall. Knowing there was a chance the subsidy would not be renewed immediately, wind companies stocked up on equipment and submitted plans for new farms in 2013 to secure the flow of money over the course of the next decade. Wind lobbyists have been begging Congress to restore the credit, as they have done with expirations in the past, because the industry quite literally cannot survive without it. “The production tax credit lasts for 10 years so if you started building your wind farm last year before the credit expired, you’re still going to get it for 10 years once you go into operation. The wind people keep saying, ‘Well maybe we should think about an orderly phase out’ well, we have a phase out it’s going to take at least ten years,” Ebell says. But what does the wind industry have to show for the massive amount of government subsidies they’re getting from the taxpayer? A new study released in late 2013 and conducted by Texas Tech University Professor Dr. Michael Giberson for the Institute for Energy Research, shows the government and wind lobby aren’t telling taxpayers the whole truth about how much wind energy really costs. According to the study, wind energy costs taxpayers $12 billion per year and shows wind power costs $109 per megawatt hour, nearly double government estimates of just $72 per megawatt hour. The study also shows wind power doesn’t decrease the cost of electricity or produce efficient power as environmental groups and government advocates claim, but instead shifts costs onto taxpayers. In addition, wind energy subsidies allow those who start wind projects to easily game the system. “The scam is, they don’t really produce any valuable power. Since the wind doesn’t blow all of the time and because the sun doesn’t shine all the time, they produce power typically when you don’t need it and specifically for wind, most of the country now, even up into the northern tier, the high demand months are the summer months when people have their air conditioning turned on,” Ebell says. “The wind doesn’t blow very much in the summer so when the power is actually valuable when you need to add as much to the system as you can find. They’re paying hundreds if not thousands to add into the system and the windmills aren’t contributing anything,” Ebell continues. “And so what happens when the windmills aren’t running? That power has to be made up by a conventional source and typically a coal plant, once you get a coal plant running, a boiler, you can’t really turn it up and down very easily. So typically they turn a gas turbine on which is basically like a jet engine. And they turn it on when the wind isn’t blowing and they turn it off when the wind is blowing. Wind companies cannot function without money from the taxpayer or without conventional sources of reliable energy. In the end, we’re hooked on a grossly environmentally unfriendly, inefficient form of energy that someday will go bust, leaving our land, our environment, and our wallets destroyed, empty, and useless.